Research has found that students who are in smaller classes perform better in all subjects and on all assessments than their peers who are in larger classes. Here at LuHi, our average class size of 25 students strikes the perfect balance of teachers to students. As we continue to grow, our commitment to that smaller class size will always remain so that we can provide the best learning environment for our students. Why are smaller class sizes better for high school students? Class size and student academic performance have been researched ad nauseum over the years. There is a significant amount of research supporting smaller class sizes at all grade levels. Rather than simply cite that research; however, we prefer to examine the benefits of smaller classroom sizes we’ve witness firsthand here at LuHi. Because ultimately, the most important “research” of all is the actual impact of class size on our students and their success. Stronger relationships between faculty and students. The relationship between teacher and student has such a profound impact on both of their lives. Every member of the faculty and staff at Lutheran High is personally invested in the success of our students. Smaller class sizes facilitate stronger relationships between students and teachers, nurturing that commitment. Our teachers love feeling stronger connections to students, and feel powerfully invested in their students’ success. Students feel supported throughout their high school journeys. We believe strongly this is a winning approach, as well as the right way to prepare tomorrow’s leaders. To coincide with smaller classes and the flexibility they provide, teachers also use flexibility in their teaching methods to include technological advancements and hybrid teaching styles to provide a strong learning environment for all students. Increased ability to get extra help where needed. Teachers love smaller class sizes, because they often facilitate better discussions and activities. They also prefer smaller class sizes because fewer students means more opportunity to observe students and provide extra assistance where needed. Students who need extra help may not always ask for it. But when teachers have the ability to build stronger relationships inside and outside the classroom, they can proactively identify and provide support for any academic challenges facing students. More opportunity to participate in class discussions. We believe in providing opportunities for every student to participate without fear or undue “competition” for the attention of a teacher. In larger classroom environments, it can be difficult for students to participate in class discussions when they are competing with 30 or more other students. If your son or daughter is shy or introverted, the stress of trying to cut through the noise and competition to contribute may shut them out altogether. Conversely, smaller classroom sizes help coax the best out of students who would otherwise prefer to “hide” among their peers in larger classrooms. Here at LuHi, students don’t “skate through” classes. We provide a safe, nurturing environment that simultaneously challenges students. This environment can have a detrimental effect on grades due to lack of participation, but also on student self esteem, which can continue through college and beyond. 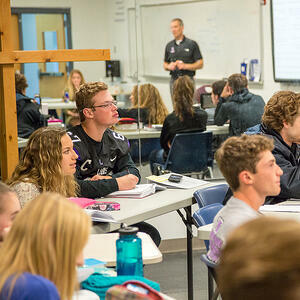 LuHi proudly offers small class sizes and a supportive environment for students. The best way to understand the LuHi difference is to visit our campus. Contact us now to schedule an appointment.